The other day my mom made YUMMY Black and White Cookies. She dyed the white parts purple. I used a kitchen tool to cut a small cookie for Peaches. Peaches is wrapped in a paper towel because I didn't want frosting on her. They were SOOO good! Peaches and I like the vanilla side best, but we LOVE the chocolate side too! Today my brother found a snake in the backyard. We think it's a garter snake. Kiki would've liked it. But her drawstring broke and we're in the process of fixing it, so she couldn't be there. 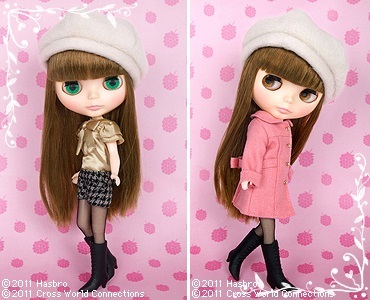 These are two of the Blythes I want next. Their names are Raspberry Sorbet and Very Cherry Berry. I love how they both have their ears pierced like Peaches (my first Blythe). I'm planning on naming Raspberry Sorbet "Keara". And I'm gonna name Very Cherry Berry "Ebony". 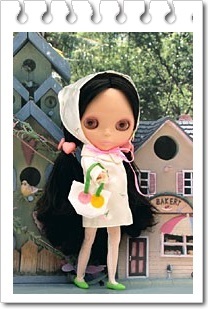 I'm planning on getting these two Blythes this year.